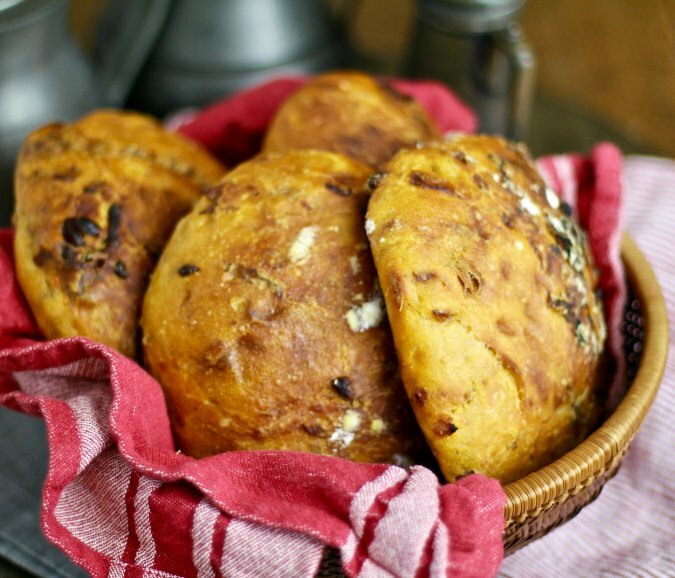 This sweet potato bread, loaded with lots of deeply caramelized onions, is super moist and flavorful. This bread is from the book Deep Run Roots by Vivian Howard. It is the bread that she uses for her Elbow Lick Sandwich, which includes smoked corn mayo, pickled red onions, and fresh tomato slices. I can't wait to make the sandwich. This sweet potato bread was pretty much the most challenging doughs I've ever worked with. First, the dough includes a large amount of sweet potato relative to the amount of flour in the dough. Second, the dough is loaded with caramelized onions, which also add a ton of moisture to the bread. 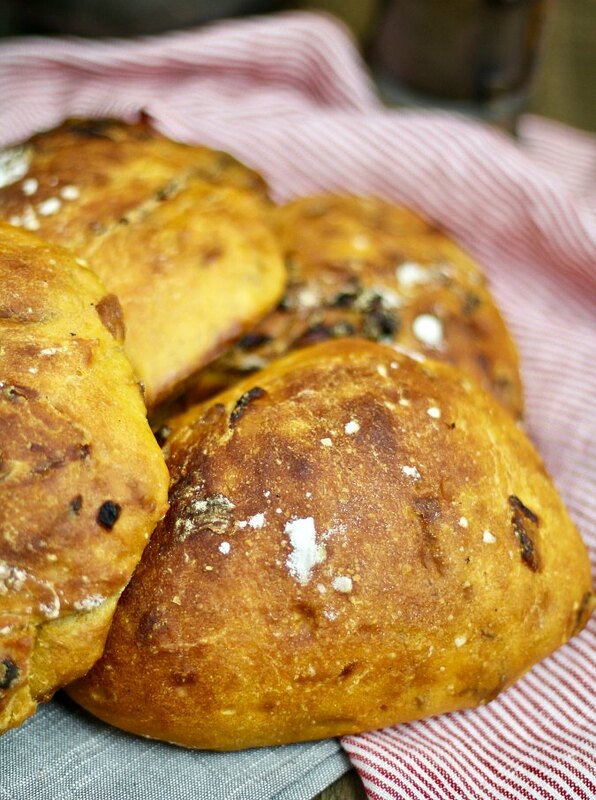 Elizabeth of Blog from Our Kitchen introduced this bread to the Bread Baking Babes. We all agreed that the bread is delicious. We also all agreed that the dough was a total challenge. In the book, Vivian Howard continuously says things like, "just be patient and don't add flour even though you'll think you should." She assures her readers that the dough magically comes together after 15 to 20 minutes of medium high speed mixing in a stand mixer. In her words, "Just give it mixing time. It's a very sticky and wet dough." No lie! I decided to follow the recipe as written and see how it turned out. My only adaptations were to add a tablespoon of vital wheat gluten and a couple of extra tablespoons of bread flour, as well as some instant yeast to the final dough. In addition, I treated my dough like ciabatta bread, and divided it into four pieces, which I roughly shaped into rustic "loaves." Unless you add extra flour, you will definitely need a stand mixer for this dough. The instructions in the book say to mix it on medium high for 15 to 20 minutes, which is hard to do by hand. As you mix it, watch it closely to see when the dough changes and begins to wrap around the dough hook. After about 15 minutes I could see a little bit of gluten development, but the dough remained very slack and sticky. If you want a firmer dough, you can cut the sweet potato puree in half. You could also cut back on the onions, but they are sooooo sweet and tasty. 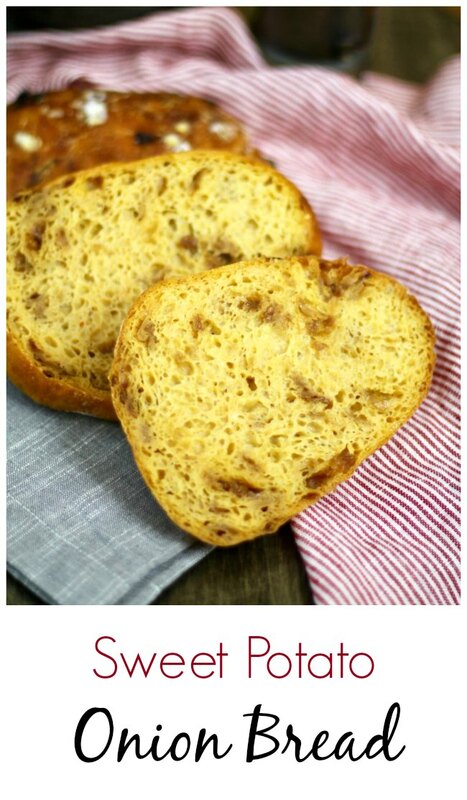 This bread takes some time to make. You will need to make a starter with flour, yeast, and water on the first day, and then make the dough the second day. 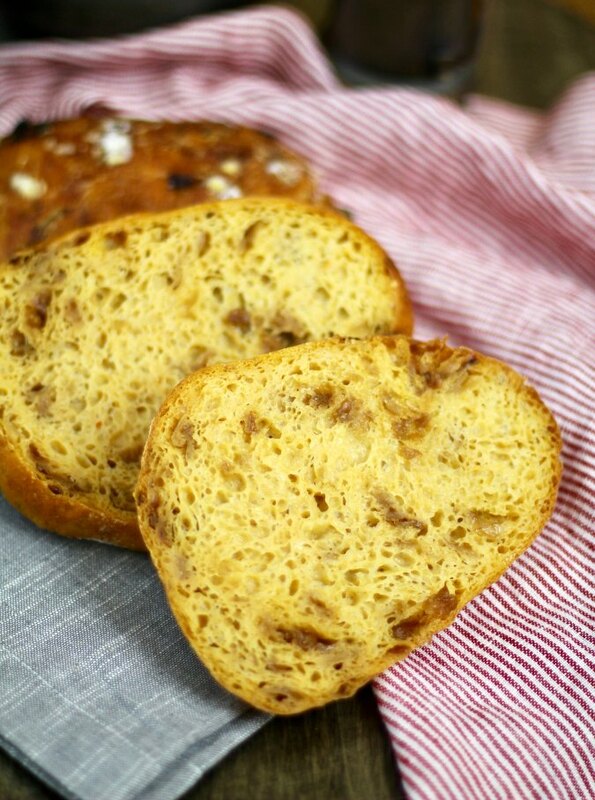 This Sweet Potato and Caramelized Onion Bread is so totally delicious toasted and slathered with butter. Yes, the bread is already super moist from loads of onions, but a little bit of butter just seems to bring a little something extra. You could also kind of dig the onions out of your slice and schmear them across the bread. The night before making the bread, mix all of the ingredients in a small bowl, cover with plastic wrap, and let rise for 8 to 12 hours. In a large skillet, sauté the onions in the oil along with a teaspoon of salt over medium low heat until caramelized and a deep brown color, stirring regularly. This took me about an hour and fifteen minutes. Let cool. In the bowl of a stand mixer, combine the flour, optional vital wheat gluten, and water, cover, and let sit for 10 to 20 minutes. Add the starter, additional yeast, honey, sweet potato puree, and the rest of the salt. Mix with the dough hook on medium high for 10 minutes. At this point, add an additional two to three tablespoons of flour if you like, but not too much. Continue to mix on medium high for an additional five to 10 minutes. Transfer the dough to an oiled bowl and cover with plastic wrap. Let rest for 20 minutes. Add 1/4 of the onions to the dough and stretch and fold it to incorporate the onions. Cover the dough and let rest for 20 minutes. Repeat three more times, adding 1/4 of the onions at a time. Cover the bowl and let the dough rise until doubled, about 2 hours. Turn the dough out onto a floured work surface and divide it into four pieces with a bench knife. Shape each piece into a rough round and sprinkle the tops with flour. Cover with oiled plastic wrap and let the dough rest another 10 minutes. Line a half sheet pan with parchment paper and sprinkle it with flour. Reshape the dough pieces into rounds and transfer them to the baking sheet. Sprinkle the tops with flour and cover with oiled plastic wrap. Let rise for about an hour while heating the oven to 450 degrees F. with a steam pan on the bottom rack. When ready to bake, add one cup of hot water to the steam pan and place the baking sheet with the loaves on the middle rack. Close the oven door. Bake the loaves for about 35 minutes, until they reach an internal temperature of at least 210 degrees F.
Let cool completely, at least 2 hours, on a wire rack. Here are more versions of this bread from the Bread Baking Babes. I love the color of your crumb! So golden, just lovely. And even reducing the water by 50g, I still mixed on high for 10 minutes and didn't see much development, so added another 50g flour. Super slack dough, and still really sticky even after my cheats. But I love your little loaves, I imagine they will make wonderful sandwiches. Thanks Kelly! They do! The onions make them so rich. your bread turned out perfect as usual! Thank you!! It is definitely not for sissies! Your bread looks wonderful, Karen! And yes. Adding butter to this quite moist bread when it's warm is perfect, isn't it? I think there's the slap and fold method that might strengthen the dough, but 20 minutes! Oy! I wish that would have worked with my dough! I love your ciabatta rolls. What a lovely colored crumb! I think these would make great sandwiches and go well with soup which is how I've been enjoying my loaf. Wow! Those look soooo good. Are the rolls sandwich size? Don't you wish it was summer for some nice, ripe tomatoes? They actually are bigger than sandwich size. They'd probably make two or three sandwiches each. And yes, I do!